Located in tarariras, the "Motorsport Capital" of Uruguay the Juan Schnyder track is the most important dirt track in all the country. 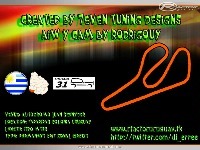 Maybe this have the most important facilites for all the drivers and the people. Also it´s the home of the "Limitada 31" series, the most popular in the west of Uruguay. The Schnyder track has their glory days when the Limitada 31 runs here, at least 4 or 5 times in every season, making the arrival of 4000 people to the "Motorsport Capital"
There are currently no setups for Autodromo Juan Schnyder. Add a Setup.